Hussey Copper Ltd. (“Hussey” or the “Company”), a global leader in copper bus bar and other copper product manufacturing,. operates manufacturing facilities in Leetsdale, PA and Eminence, KY with approximately 550 employees. With a fully integrated mill, the Company is able to capitalize on the trend towards outsourced fabrication and provides a wide range of flat rolled copper products for the electrical distribution, industrial and residential construction markets.. The 163 year old Company manufactures its products from melting and casting its copper to providing the finished product or component part. Hussey had a history of strong revenue growth and positive EBITDA. The global economic downturn had a significant impact on the copper industry and the Company’s financial performance as reduced corporate capital spending led to decreased demand for its products during 2009 and 2010. Although the Company experienced improved performance at the beginning of 2011, liquidity constraints coupled with copper price volatility limited the Company’s ability to purchase inventory and severely constrained operations. 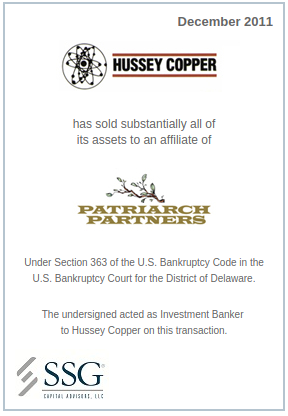 Hussey engaged SSG in April 2011 to explore a sale of substantially all of the Company’s assets. SSG marketed the Company to a wide range of strategic and financial parties and received multiple offers for the Company. An acquisition entity of Kataman Metals was chosen as the stalking horse bidder at $84.7 million and the Company filed Chapter 11 in September 2011. SSG remarketed Hussey over seven weeks and had a mini auction over two days at the bid procedures hearing, resulting in an increase in the stalking horse bid from Kataman plus additional consideration and without a breakup fee. By the bid deadline, four qualifying overbids were received which resulted in a robust Section 363 auction with Patriarch emerging as the winning bidder for a price approximately 27% higher than the original stalking horse bid. The gross purchase price of $107.75 million was sufficient to pay secured debt in full and provide a sizeable distribution to the unsecured creditors.